My desk is always a disaster. Always. Piles of papers. Yucky! I'm a huge scatter brain as well.. perhaps it comes with the hair color? Anywho. I was always losing my grading scale at the beginning of the year so I came up with this genius idea... 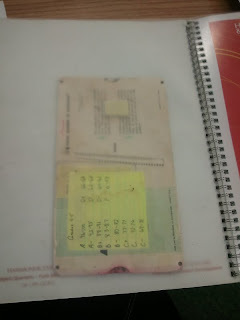 I used Velcro to stick it on the inside of my grade book. Guess what? Problem solved! Any other tricks I need to know about?? Did you find this in Grandmas basement?! nooo silly it came in my desk!